NSK Ltd. (NSK; Headquarters: Tokyo, Japan; President and CEO: Norio Otsuka) yesterday announced that it has developed a hub unit bearing* equipped with a high-reliability seal that delivers superior dependability in the toughest environmental conditions. NSK is targeting 4 billion yen in sales in 2016 for this product by expanding sales throughout the global market, beginning with emerging nations. 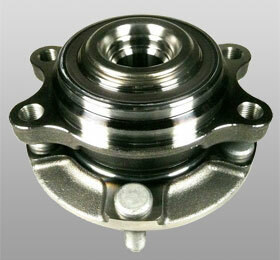 A hub unit is a part that integrates the bearing with the hub on which automobile wheels are mounted. Of all the components of an automobile, the hub unit bearing is located closest to the surface of the road, and so it is exposed to muddy water easily. Despite this, it must maintain a high level of reliability due to the critical role it plays supporting the vehicle frame. NSK has been working to penetrate the global market with its hub unit bearings, which even before this new product already had a seal for improved water resistance, especially in emerging nations. However, in regions such as Russia, there are poor road conditions unique to cold weather such as snow, ice, slush, and mud created as the snow melts on unpaved roads. Such regions require an even higher level of resistance to muddy water. Furthermore, in recent years, even among emerging nations, the demand to reduce CO2 emissions along with rising gasoline prices have made improved fuel economy an imperative for automobiles, which means that friction must be reduced and reliability must be improved. In response to this situation, NSK has developed a hub unit bearing with a high-reliability seal that achieves superior dependability in the most challenging conditions by suppressing the increase of friction and improving muddy water resistance while utilizing the same-sized seal as its conventional product. The addition of a sub-lip to the seal prevents mud intrusion, which can hinder the movement of the lips. This feature improves muddy water resistance by 1.5 times compared to the conventional product. By keeping the size of the seal the same as that of NSK’s conventional high performance seal, the company was able to keep the hub unit bearing size the same as well, thereby enabling use of its new high-reliability seal. Through the use of computer analysis, NSK optimized the surface pressure distribution on the seal lip so that, even with the addition of the sub-lip, overall sliding resistance in the seal was still reduced.In this way, NSK has been able to achieve the same friction level as its conventional hub unit bearing.